Race for the Galaxy is a great game, but setting it up can be a real challenge – especially when you integrate its first three expansions: The Gathering Storm, Rebel vs. Imperium, and The Brink of War. Figuring out setup with these expansions (especially after a long absence) requires you to thumb through four different instruction manuals. 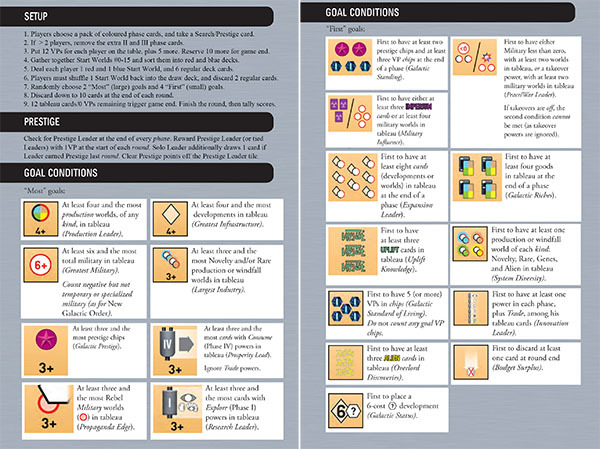 We’ve consolidated all of the setup rules for Race for the Galaxy in this handy, printable Race for the Galaxy Setup Guide, which prints at the perfect size to fit in your base game box. Enjoy! Note: Race for the Galaxy and its expansions are ®Rio Grande Games. This player aid is offered free of charge, as a goodwill gesture by Nights Around a Table. You won’t need this printable guide until you own Race for the Galaxy, and perhaps one or two expansions for it! Get that ball rolling by following the link below; if you buy your copy on Amazon, we’ll earn a small commission.